The word “Pondok” means “hut” in Malay. I guess Red Palms is like this very colorful, IKEA-inspired … tropical hut. With tropical music. Came for dinner at around 6:30PM this past weekend, and throughout our stay the restaurant was at a consistent 50% full (maybe 30 odd people). There is the head chef, a big friendly, bubbly guy who comes out to meet all his customers. He explains how things are prepared, brings and serves the dishes from the kitchen with great enthusiasm and care. He saw us out when we left. I saw one other sous chef and another cook in the kitchen. The only other person working here is who I assume to be the manager – he is the only wait staff and does everything from taking orders to preparing drinks, from serving dishes to cleaning up. This is Dinner Dash in real life folks… at the difficult levels. More on this later. A little plate of nuts and salted fish to start. Gado Gado – $7. 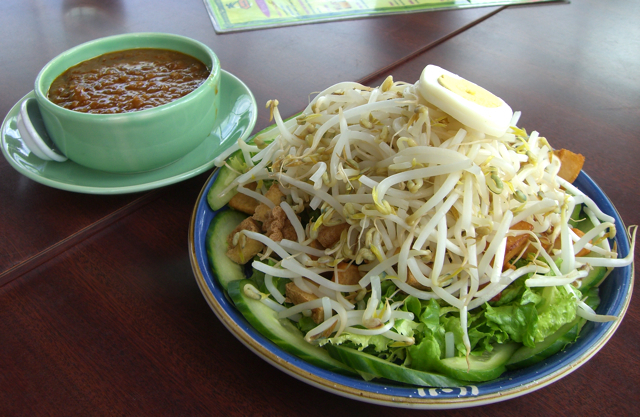 The typical Malaysian salad with bean sprouts, shredded cabbage, tofu, and hard boiled egg. Theirs also had cubes of jicama, which is a nice touch and very refreshing. I asked for the dressing on the side – it’s a peanut dressing, very good, served warm. 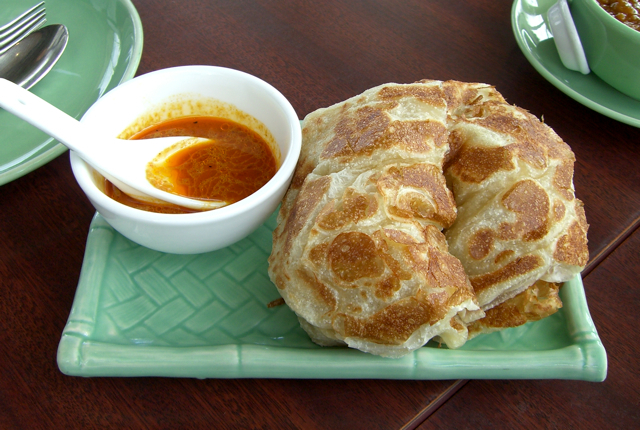 Plain Roti Canai – $3. This is one piece of flat bread. I would have expected at least twice the amount of bread for this price. 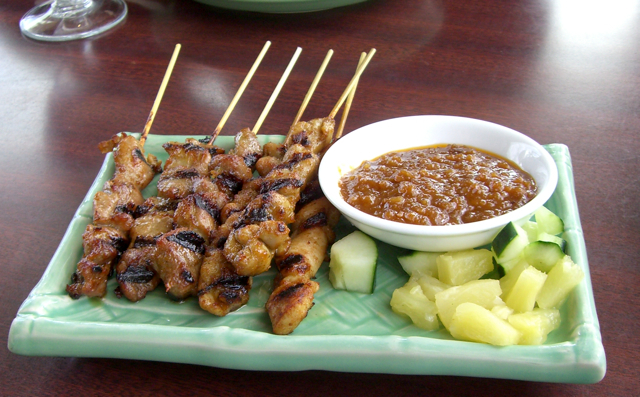 The dipping sauce was spicy and slightly sweet- made with two different curries and coconut milk. But the Gado Gado peanut sauce was better. Chicken Curry – $12. For the curry dishes you can pick from 9 different curry sauces to pair with your choice of meat (beef, pork, lamb, chicken, fish, lobster, shrimp, scallops, and crab). This was the Sambal Tumis curry. It also has potatos and onions in it. The curry was OK. Steamed mullet – $15. This is not too bad a price for a whole frozen fish, I guess. The sauce was not as sour as I would have liked for this kind of steamed mullet, because they used some different ingredients. But the fish still tasted pretty nice. It is garnished with generous slices of shitake mushrooms, pickled cabbage, and cilantro. Served in a metal fish-shaped “pot” (as it should) that is heated by a little fire below, which sufficiently kept the fish nice and hot. Half of a Hainan poached chicken, for $14.50. Half a chicken for that price, and it tasted exactly like a 白切雞 (“white cut chicken“, basically plain steamed chicken), with absolutely no Hainan flavor! I can buy a better tasting 白切雞 at a bbq store for almost half that price! A few pieces were also … uh, very raw. Fried Gailan, for $9.50. I wasn’t happy with this, as we had hoped to have the fried Kang Kong (the first choice at Malaysian restaurants), but they didn’t have any Kang Kong. The shrimp sauce that the gailan was sauteed in wasn’t bad, but they definitely drowned the gailan in way too much sauce. The price is OK for a dish of veggies, considering it also had jumbo prawns and slices of 臘腸 (lap cheung, dried Chinese pork sausage). I thought it rather strange though, that a restaurant that supposedly promoted “healthiness” would actually serve fatty lap cheung with your veggies. Overall, some dishes are reasonably priced, others (like the Hainan chicken and the Roti Canai) are totally not. They do have a set dinner of Gado Gado, Bak Kut Teh soup, choice of curry, seasonal veggies, rice, and a drink for $12.99. This is probably a much better deal, if you are fine with the set and don’t need to try anything else. Maybe I didn’t order the right things, but the dishes are not any less saucy and the sauces were not significantly less oily looking. Maybe their curries are not that oily… I have been to other places where I didn’t taste any MSG, but maybe there are the “hidden” things like lower sodium and sugar levels here… I am not sure. But I certainly didn’t leave feeling I had as healthy a meal as their ad had touted, or that it was any “lighter” than any other Malaysian place. The Dinner Dash phenomenon: In terms of service, I am never that picky when it comes to Asian restaurants. Of course, I don’t tolerate obvious things like rudeness. But in general, I expect a certain level of courtesy and promptness, anything else is a bonus. I don’t complain much. But. The people at Red Palms are definitely nice, and I enjoyed meeting the chef. But they are also very busy, at 4 staff (3 of them in the kitchen) to half a restaurant. Service is very slow, and pretty much non-existent when the sole waiter/manager disappears to help out in the kitchen (which he does quite often). Then I realize part of the reason why you get to talk to the chef so often is because he has to be a waiter half the time! Three people can only cook so much so quickly, so dishes (especially the special ones) come out slowly. Though if you order the set dinner it does arrive a bit faster. I can’t imagine how long dinner would have taken if the restaurant was full. With their funky prices it worked out to be about $25 per person including tips; everybody left quite full and there were left overs enough for lunch. I might come back for their seafood, perhaps the lobster, but if I wanted my Malay fix (or if I were really hungry), I would go somewhere else (where that is would be in a future post 😉 ). Not bad, not great. Worth going once, the rest is up to your tastebuds. They make a good green papaya salad, which seems to be something of a rarity around here, even at Thai restaurants. (It seems weird because I have bought green papayas myself, so it’s not like you can’t get them here.) Anyway, I love green papaya salads. They are the very reason I bought a julienne peeler. Lemongrass’ green papaya salad is unlike traditional Thai Som tam – there aren’t any tomatos, green beans, or hot chili peppers. 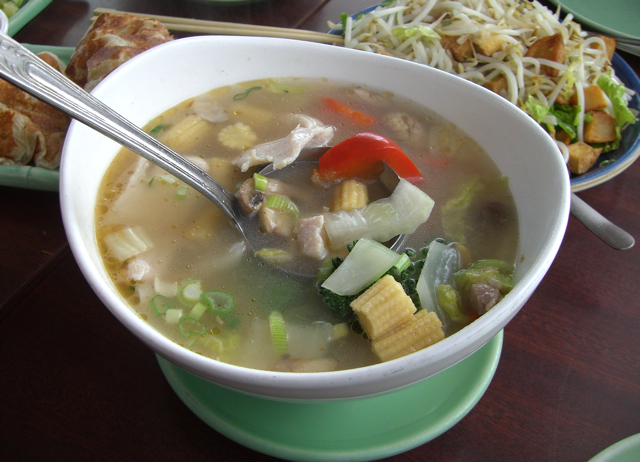 Instead, to go with the julienned green papaya, there are carrots, daikon, large prawns, and pork slices. 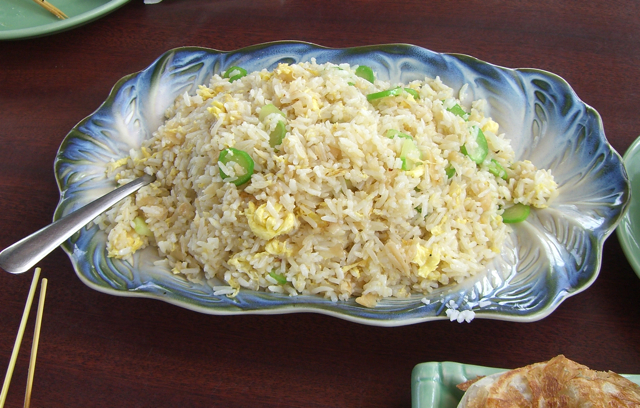 It is richly garnished with chopped peanuts, roasted garlic, and mint leaves. Whereas Som tam is spicy, this salad is sweet – especially when drizzled generously with Nước chấm (Vietnamese dipping sauce). 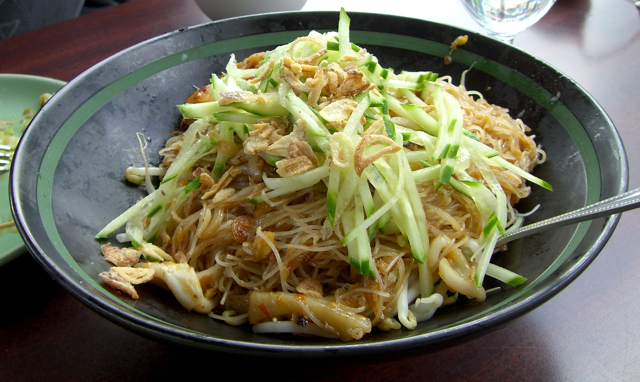 Definitely a delicious and refreshing take on green papaya salad. And like I have mentioned previously, their salad rolls are also a favorite of mine. 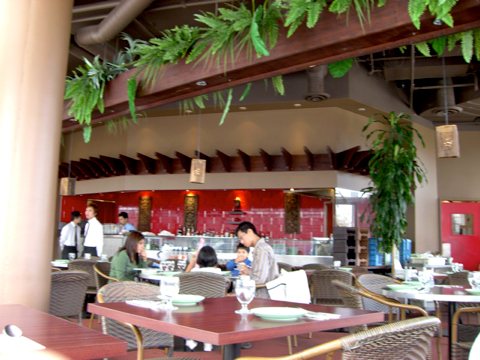 Lots of choices on the menu too – good Pho and dry noodles. There is a little patio outside. Parking lot is squishy and space is limited.